This holiday season was a mellow one for me. I just put my feet up and enjoyed the company. I only cooked something simple on Christmas Eve night - stuffed portobello mushrooms as starter, roasted new potatoes as side dish, grilled rib eyes as main course, and some fruit yoghurt as dessert. I was even too lazy to find a recipe for the stuffed portobellow mushroom, and simply made one up myself. To be very honest, it was definitely not a WOW dish, but was a good and simple starter for sure. 1. Heat the oven grill to high. In a small bowl, mix the cheese, breadcrumbs, parsley, and tomatoes together. Season with salt and pepper. Set aside. 2. Spray a small oven dish with vegetable oil. Lay the mushrooms gill side down in the dish, and grill for about 4 minutes. 3. 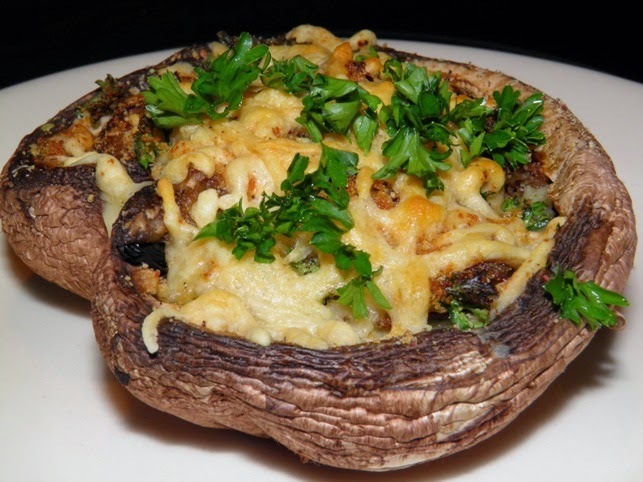 Turn the mushrooms and stuff them with the cheese filling. Return to the oven and grill for another 5 minutes, or until the cheese is melted. Sprinkle with some roughly chopped parsley and serve.